Just going by pedigree of the writers involved, “Destiny Of The Daleks” should be a lot better than it is. It marked the final Doctor Who script from Terry Nation, one of the series’ oldest and most reliable writers and the creator of the Daleks. The story also marked the debut—as script editor—of the inimitable Douglas Adams, who had written “The Pirate Planet” for season 16 the year before and was now taking over the big chair. And “Destiny Of The Daleks” was a huge success at the time, setting new viewership records for the series along with the following story, “City Of Death”—both helped a lot by a strike that had taken the BBC’s main competitor, ITV, out of action. But although there’s a lot to enjoy here, especially in the early episodes, in the end the story fizzles out. It’s dragged down chiefly by a revisionist take on the Daleks and their creator Davros that makes both less interesting and fails to build on the promise of their previous appearance in “Genesis Of The Daleks.” It’s sunk further by miring the pepperpots in a stalemate with a deadly dull army of alien robots, the Movellans, who look something like Milli Vanilli in white disco outfits. 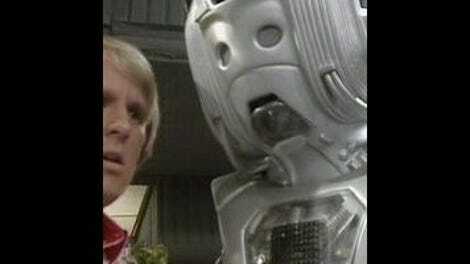 The downside of this was that their on-screen chemistry was sometimes too cute and precious by half, but their easygoing charm together was also a key part of the lighthearted sense of fun that was the hallmark of Doctor Who during producer Graham Williams’ tenure on the show—particularly while Adams was on board. And that dynamic is immediately present from the moment Ward appears on screen here, in a witty Adams-written regeneration scene that sees her trying on new bodies like suits of clothes (“The arms are a bit long, but I can always take them in”) until she settles on one that she and the Doctor both like. (It’s something of a riff on Baker’s costume-change scene in his own regeneration story, “Robot.”) Since Romana is a Gallifreyan like the Doctor, using regeneration is the obvious solution to the cast-change problem, but the scene has been criticized for being too whimsical about it—after all, if the Doctor’s regenerations have always been caused by life-threatening trauma to his former bodies; isn’t Romana doing something close to committing suicide for a fashion choice? It’s problematic, but nothing that couldn’t be papered over by some later retroactive explanation, if anyone felt like it was important. It’s a well-crafted bit of comedy that does exactly what it needs to do—economically and entertainingly establishing what’s essentially a new character and defusing the potential difficulty of Tamm’s sudden disappearance by acknowledging the change with a joke and then moving on so the story proper can get started. Given the circumstances behind the scenes, it’s hard to see a better way to introduce the new Romana than what Adams came up with. With that out of the way, the story moves on to the main plot, landing on a mysterious planet that the Doctor finds uncannily familiar. We can guess that it’s the Dalek home planet of Skaro because we’ve seen the words “Of The Daleks” on the title screen, but the Doctor has no clue—he’s landed here at random. What follows is a typical, even stereotypical, opening episode to a Terry Nation serial: The TARDIS crew explores this strange landscape picking up clue after clue pointing toward something dark and dangerous, culminating in the shocking twist that those Daleks you saw mentioned in the title are actually going to appear in the story itself. Nation overused this structure, but it’s an effective way to kick off a story. The radiation, the abandoned and ruined city, the strange earthquakes that reveal themselves to be artificial drilling, and the ragged figures from faraway planets burying their dead in makeshift cairns all add a sense of foreboding, and might even suggest the nature of the Daleks plan to a sharp-eyed viewer who remembers the underground bunker from “Genesis Of The Daleks.” And if we can guess what mortal dangers are facing the Doctor and Romana but they can’t, that just helps build tension. It’s a formula, but it lays out the basic elements of the story in a way that’s clear and organized. And this first section of the story, up until the discovery of Davros, is the only part of “Destiny” that is satisfyingly entertaining—a grim Terry Nation story leavened by Douglas Adams jokes with all the potential greatness that suggests. It’s undone, though, by what comes afterward, when the story runs headlong into the weaknesses in how Davros, the Daleks, and the Movellans are portrayed, and turns fatally silly even as it’s trying to turn more serious. In the end, “Destiny Of The Daleks” winds up being something that neither Nation or Adams is usually guilty of, whatever their faults as writers: It’s boring. Once Davros awakens and he and the two opposing “robot” armies take over the story, all the air is sucked out of the room. The idea that the two armies reach a point of stalemate because they’re both so computer-dependent that neither can make a move until they figure out an ironclad logical killing-stroke is simplistic at best, and seems better suited to a half-hour Outer Limits episode than a two-hour Doctor Who serial. It makes both the Movellans and the Daleks look like idiots, and makes the story crawl to a conclusion that could have been resolved in half the time. Of the villainous triad, Davros comes off least worst, though David Gooderson portrayal is a far cry from Michael Wisher’s magnetically unhinged performance in “Genesis Of The Daleks.” However, the dialogue doesnt’ give him much opportunity to be the sneaky and devious master-planner of the earlier show—he’s mostly just angry and aggressive. The Movellans are stern-faced and a little threatening, but since we discover early on that they’re the enemies of the Daleks, it’s meant to be shocking when they turn out to be ruthless and deadly and not the dreadlocked white knights you might have assumed they are. But that revelation is toothless since they’re so dull that it’s impossible to care about them one way or the other. They’re deliberately written and acted as flat, bland robots who are easily fooled and can’t handle the byzantine complexities of paper, scissors, rock. They don’t inspire fear, dread, joy, or awe—just ennui. But it’s the mishandling of the Daleks that really dooms the story. The key problem also showed up to a lesser extent in “Genesis Of The Daleks,” which often treated them as if they were computers that could be programmed rather than the twisted, mutated wreckage of what had once been people—and, importantly, were still people. “Destiny Of The Daleks” takes that a step further and flat-out calls them “a race of robots” several times. That’s not only a far more generic, uninteresting concept, but it turns them passive and unable to think for themselves, all in the name of giving a reason for Davros to be resurrected. At the end of “Genesis Of The Daleks,” Davros was betrayed and shot by his own creations, and the story ended not with a focus on him but the Daleks’ defiant declaration that despite being entombed underground, one day, yes, one day they would come back. 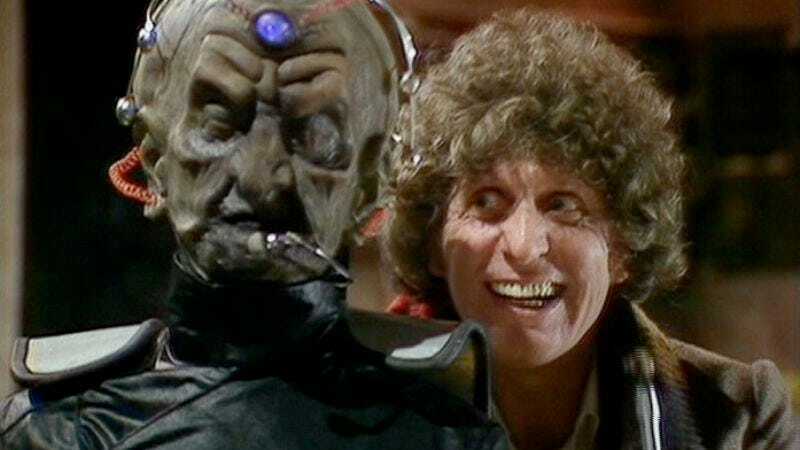 Though Nation apparently claimed he’d always planned to bring Davros back, it’s not evident in that serial: The weight of the narrative suggests that he’s dead. So it’s “Destiny Of The Daleks” that really establishes Davros as the primary character of the Dalek stories of the 1980s. Before this, the status quo for the Daleks was to expect that they’d get out of the ruins of the Kaled city and go on to conquer the universe the way they did before. In “Destiny,” the Daleks did get out, but have instead become a gang of neutered failures. It’s Davros who we actually see rising out of the Kaled ruins, and Davros who makes good on the Daleks’ threats. The survival of Davros, in fact, threatens the Daleks as much as the Doctor: By insisting that he is the natural leader of the Daleks, who he clearly sees as not merely his children but his property, he makes them of secondary importance in their own story, reduced to the status of henchmen in desperate search for a supervillain they can call master. In “Genesis Of The Daleks” and in some later Dalek stories, they’re not nearly so compliant, but here the script lets Davros get away with it: The Doctor beats Davros, but Davros beats the Daleks. Once he enters the story, the Daleks cease to function as characters with their own motivations. They just follow his orders, and hardly have any dialogue before the Doctor tricks Davros into blowing them up. This was part of the reason Davros was invented in the first place, of course: The Daleks are difficult to portray as dynamic, interesting characters in their own right, because the insect/tank/robot design that makes them so visually memorable also robs them of faces and individual voices and identities, and makes it almost impossible to give them more than three lines of dialogue in a row without making people’s eyes glaze over. But “Destiny Of The Daleks” gives up on the whole idea of trying to do anything with them, making the mistake of assuming that there’s nothing inherently interesting about Daleks at all. If that were true, they would never have lasted past the early 1960s, let alone have achieved such longstanding iconic status on Doctor Who. If they were truly boring they would have faded out of memory just like the Mechanoids or the Krotons or, well, the Movellans. It’s true that their limitations make it hard to tell a Dalek story well, but that’s no reason to make nonentities out of them. Daleks are important, even crucial, to roll out every once in a while because opposing their fascist, brutal, paranoid aggression helps define what the Doctor himself believes in, and therefore what the moral center of the series is. Adams’ legacy as Doctor Who script editor is hit-or-miss, with only “City Of Death” really standing out as an unalloyed classic. He was probably stretched too thin at the time to do justice to Doctor Who—The Hitchhikers’ Guide To The Galaxy had unexpectedly turned into a pop-culture juggernaut, and in between Doctor Who work, Adams had to find time to write not only the second Hitchhikers’ radio series, but the TV pilot and the first novel. “Destiny” seems to have been shortchanged of his attention, especially after (so Adams claims in M.J. Simpson’s biography Hitchhiker) Nation didn’t bother to write a usable first-draft script since his contract assured he’d be paid for and credited on any Dalek serial, and turned in what Adams called “a couple of explosions and a couple of people running up a corridor,” leaving Adams to fill in all the dialogue and alter the plot as necessary. I don’t know Nation’s side of the story, but if that’s even partly true it goes a long way to explaining how this one took such a wrongheaded turn despite such a promising start. The author of The Origins Of The Universe, the book the Doctor reads while he’s trapped under the rubble, is Oolon Colluphid—an in-joke reference to the character in Hitchhikers’ Guide who wrote the trilogy of philosophical blockbusters Where God Went Wrong, Some More Of God's Greatest Mistakes, and Who Is This God Person Anyway? K-9 makes a brief appearance, but never leaves the TARDIS because Terry Nation insisted, probably correctly, that the Daleks would look especially silly and unthreatening if a robot dog with a laser nose was seen to be a match for them. In the third episode, one of the Movellans corrects the Doctor on the pronunciation of her name: It’s “Agella” with a hard G, not a soft G. Maybe I’m missing something—was there any significance to this? It seems pointless, and I wonder if it wasn’t actually a line flub on Tom Baker’s part that should have meant that they shot the scene over again, especially after the actress playing Agella called unnecessary attention to the error by correcting it out loud, in character.